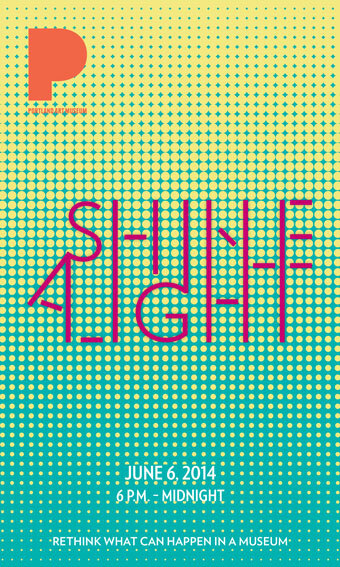 The Portland Art Museum’s popular Shine a Light event returns on June 6. A collaboration with Portland State University’s Art and Social Practice MFA Program, the event features a mix of artist-driven installations, performances, and interventions throughout the Museum campus, offering an exciting opportunity for visitors to reconsider their relationship to art, to engage with the Museum in unexpected ways, and to think about the role of museums in people’s lives in the 21st century. Now in its fifth year, Shine a Light asks visitors to rethink what is possible in an art museum. Projects for this year’s event include a live radio hour, beer inspired by artwork, arm wrestling with artists, museum karaoke, tarot card readings customized to the Museum’s collection, and interactive performances shaped by the movements of docents, guards, and museum visitors, among many others. One of the hallmarks of Shine a Light is that the majority of artist projects activate gallery spaces and create dialogues with the Museum’s collection in unexpected ways. Shine a Light turns the Museum into a site of art production and practice and not just a space of display. It’s a night of celebration and community that invites visitors to be part of something bigger than themselves. One feels a sense of a collective museum as much as a museum of collections. From June 6 to June 13, 2014, your valid TriMet hourly ticket, monthly or annual pass gives you free general admission to the Museum. Free Admission kicks off on June 6 with Shine a Light from 6 p.m. to midnight. The first 100 people to show their TriMet pass or ticket at the door receive free admission to this special event. A valid TriMet ticket is defined as a single ride ticket purchased on the day of your Museum visit or a current monthly or annual pass. Ticket good for one general admission entrance (Northwest Film Center tickets are not included in this offer). This TriMet-Portland Art Museum free admission offer is part of the project Talking About Museums in Public (see below). Organized by artist Jen Delos Reyes, Talking About Museums in Public brings together a group of Portland artists to encourage public conversation and thinking about the role of museums in people’s lives in the 21st century. Projects will take place in the month of June throughout the city and at the Portland Art Museum. Click below for schedule and more information. Friday June 20, 3-5 p.m. — Walmart parking lot, 4200 SE 82nd Ave.
Would You Rather — Located in the link from 7 to 9 p.m. Radical Acceptance Audio Guide — Available at the tour desk. Available at the tour desk every Free Friday through September and during Shine a Light.